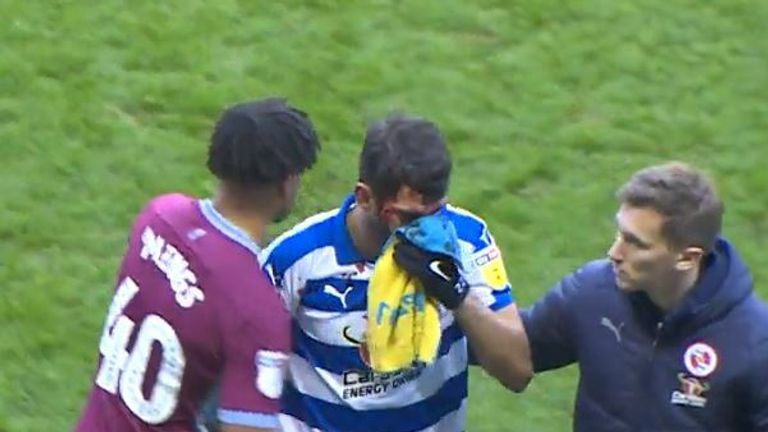 Aston Villa defender Tyrone Mings has apologised for accidentally stepping on the face of Reading striker Nelson Oliveira. The incident happened in the 73rd minute of the goalless draw at the Madejski Stadium on Saturday. Mings, who was making his debut after completing a loan move from Bournemouth, caught Oliveira's face with his boot. The Portuguese, who was appearing for the Royals for only the second time after a loan switch from Norwich, was treated on the pitch and later taken to hospital with a suspected broken nose and serious facial injuries. Reading confirmed Oliveira underwent surgery on Sunday and "is recovering well". Mings stopped play himself after realising what had happened with referee Geoff Eltringham missing the incident. The 25-year-old centre-back later took to social media to apologise saying: "Absolutely loved wearing the claret and blue today and over the moon with the clean sheet! @AVFCOfficial. The incident comes almost two years after Mings was handed a five-game suspension for violent conduct in March 2017 when he stamped on Zlatan Ibrahimovic while playing for Bournemouth against Manchester United.